Cats love to climb, to which any cat owner can attest, and will climb on anything. Providing cats with their very own climbing tower helps keep them off the furniture, while still fulfilling their natural climbing instinct. Climbing towers can be simple, from old tree trunks and repurposed lumber and dresser drawers, to complicated constructions complete with tunnels and dangling toys. Cut two pieces of ½ inch plywood into a 24" by 24" square. Cut a 4" by 4" wide notch out of the exact center of the top piece of plywood. Measure 10 inches from each end to determine the center. Cut four 14-inch long pieces of 2" by 2" boards. Nail the bottoms of the four boards into each of the four corners of the bottom piece of plywood. Nail the top piece to the upright boards to complete the base. Slip a 79-inch (or size of your choice) piece of 4" by 4" lumber into the notch you have cut out of the top platform and nail it into place at the bottom of the piece. Use non-toxic glue around the edges of the notch cut out of the top plywood piece to help hold it in place. Cut three 14-inch square pieces of plywood and measure and cut a 4-inch notch out of one corner of two of the pieces. The top piece remains intact. Nail the notched corners to the 4" by 4" post to secure each shelf of the cat tower. Attach shelf brackets beneath the shelves for added stability if desired. Nail the top shelf from the top down, placing the nail in the center of the shelf. Make sure that the nail heads are all flush with the board. Cut pieces of remnant carpeting to sizes slightly larger than the wooden base and shelves and staple the edges to the bottoms of the wooden pieces. If desired, wrap more carpeting around the center support post and glue into place at the edges. Carpet each board before nailing it to another for a professional look. 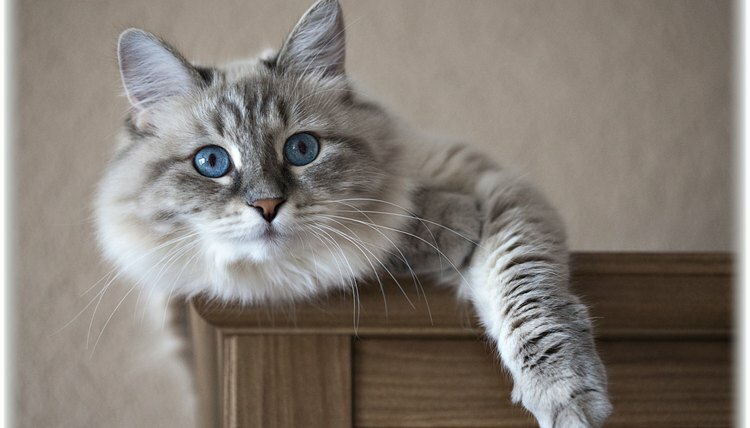 Make the cat climbing tower sturdier by nailing or tacking its top shelf to a wall if desired. Add dangling cat toys to some of the shelves to make the tower even more appealing. Place a favorite bed on one of the shelves to entice the cat to try it out. Make sure when gluing pieces that the glue used is non-toxic to cats since they tend to bite their toys.